Now I save this site as template. Then I create a new sub-site based on the template. 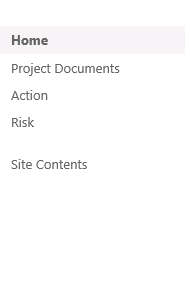 But the problem is that inside the new sub-site the "Home" link will still be referencing the original sub-site which I saved as template,, while for the other links; project documents, action, risk & site content they will be referencing the new sub-site which is valid..
Can anyone advice how I can fix this? So the Home link will be referencing the newly created sub-site rather than referencing the original sub-site which I saved as template? And could the problem be that I have manually edited the original sub-site Home link in the past? Browse other questions tagged 2013 site-collection navigation site-template quick-launch or ask your own question.